Secondary Inspection. If questions arise and the Customs and Border Protection (CBP) is unable to admit you quickly, you may be taken to a separate area for “secondary inspection.” A referral to secondary inspection by itself is not an adverse action, but you can expect to be detained anywhere from a few minutes to several hours or longer if an issue arises. During secondary inspection, the CBP will ask you questions and may collect biographic and biometric data, run record checks, and determine whether you should be admitted to the United States. Role of your consulate. You have the right to contact your consulate for assistance if you are referred to Secondary Inspection. The consulate can help you contact a lawyer or your family. Right to a lawyer. If you have a lawyer, you should ask CBP if you may contact your lawyer. Because you are not under arrest, and immigration is not a criminal matter, CBP may restrict your access to a lawyer and may refuse your request. Right to privacy. You do not have a right of privacy that protects your mobile phone, computer, tablet, or other electronic devices. CBP may search your device and access your email and screen your social media activity during the inspection process. Your phone, laptop, or other digital device may be held and returned to you later. Signing documents. You have the right to review all written statements that are prepared for you, in a language that you can understand. If you do not agree with the contents of any papers that are presented to you, you may refuse to sign them. You remain a Legal Permanent Resident (LPR) unless the government proves that you have abandoned your residency by clear, unequivocal, and convincing evidence and an order of removal is issued by an immigration judge and becomes final. This means that you cannot be deported right away and you have a right to see a judge who will determine whether or not you can remain in the United States. Any documents you sign must be signed voluntarily, including Form I-407. You may refuse to sign the form and there are no negative consequences if you refuse to sign it. CBP must issue you a Notice to Appear (NTA) before an immigration judge who will determine if you have abandoned your U.S. residence. CBP cannot make this decision on its own. 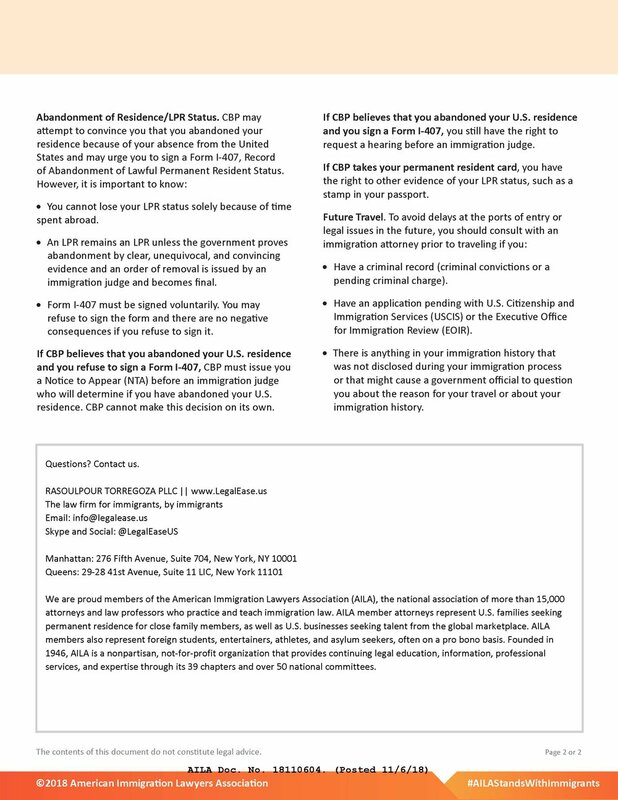 If CBP believes that you abandoned your U.S. residence and you sign a Form I-407, you still have the right to request a hearing before an immigration judge. If CBP takes your permanent resident card, you have the right to other evidence of your LPR status, such as a stamp in your passport. To avoid delays for future travels, you should consult an immigration attorney before you travel if you have a criminal history, have an immigration application pending or have anything in your background that might cause CBP to question you upon entry into the United States. If you have any questions about how this may affect you, please contact us we can help. Follow us on Instagram, Twitter, Facebook, LinkedIn and Tumblr, for up-to-date immigration news. Older PostWho can be the petitioner for an O-1 extraordinary ability visa?